Todd & I don't have a set way to celebrate V-day-we never know which of is going to be working or we may both be off or both working!! This year though we were both off which a present in of it's self! 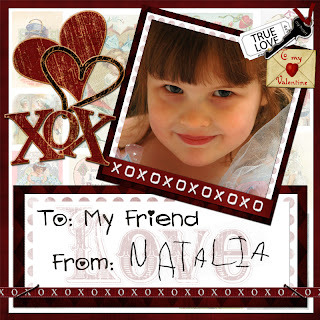 We took Natalia to daycare so she could participate in their V-day party. I made her valentine's with her picture on them, I also had her write her name on a piece of paper and then scanned it in and added it to the valentine's I printed off-that way she didn't have to sign 24 of them! We attached them to goody bags with these wonderful, individually wrapped fortune cookies dipped in white chocolate with valentine sprinkles-yummy! We also added two red pixy sticks in the bags. Natalia helped me put them together-she was so proud and so very excited for today! After we dropped her off we went together to have our first laser hair removal treatments-Todd had the back of his neck done and I had my armpits and bikini line-this was our V-day present to each other-extremely romantic huh???!! LOL!! We picked up Natalia in the afternoon and went out to dinner. She was acting tired and kept coughing. When we got home and were going thru her Valentine's from her friends I realized she was really warm to the touch so I took her temp and sure enough she's running a 100.1 fever! So we gave her some Motrin and cough medicine and now she's laying in bed with me watching TV-poor thing-not a fun way to end Valentine's Day!!! Not the most traditional V-day but it works for us! I hope everyone had/or is having a wonderful Valentine's Day-whether you have a special someone or you are single!! Meg's prompt for today is: List five things you’d like to change about yourself. Then list five things you wouldn’t change. 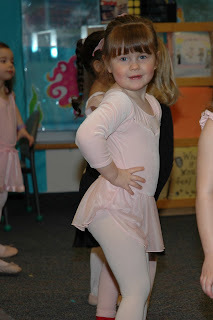 Today at Natalia's dance class at school it was parents day-so I went to watch with my camera in hand of course! 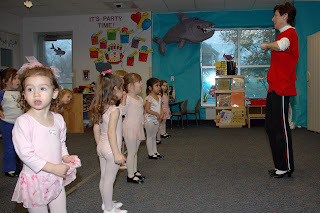 They were so cute but I'm not sure how Miss Barbara does it with all those litte girls! I do have to say though that Natalia has learned SO MUCH from her-I'm so glad I didn't send her back to Sheena's-she didn't learn anything there and they cost more!! After dance class Natalia and I went to LAWL so I could weigh in-I hadn't been in since last Wednesday and wasn't sure I'd lost anything-the home scale was saying I had lost a little but there scale is always different. Also I haven't been to the gym since last Monday since I've been feeling so awful. But I was pleasantly suprised to see that I was down another 1.2 lbs for a total of 6.4 lbs in a little over 2 weeks-waaaahoooo!! Looks like winter is back here in Texas after some nice days with warmer temps were back down in the 30's with possible flurries tomorrow-although I normally love the winter I'm ready for warmer weather so maybe I can get rid of this cold!! I've decided to join in with Meg's Blog Prompt at DSP. Yesterday's prompt was: List some phrases that you hear your spouse (or other family member) saying a lot. 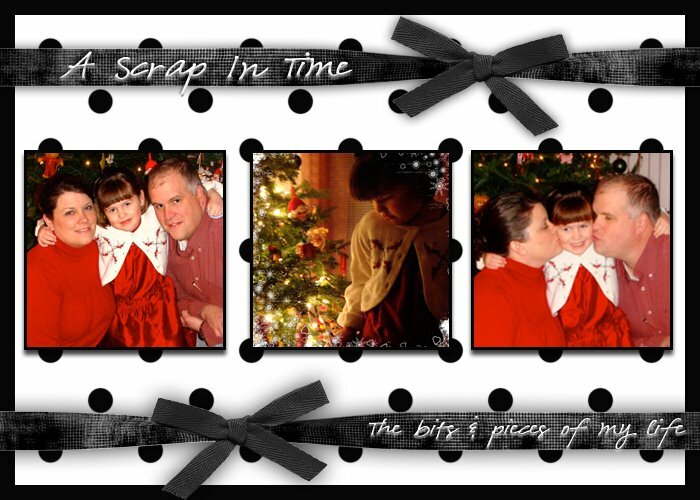 Or, for something different, take note of some of the funny things that come out of the mouths of the kids in your life! For me right now that word has to be "sure"-it's my husband's favorite and it drives me crazy! He pretty much says it after everything I say-it can be sincere, funny, sarcastic, whatever he wants it to be and like I said it drives me CRAZY!! My new response to him when he says it is "did you just say SURE?" and he calmly says "sure..."-MEN!!! I've been spending a quiet day at home with Natalia since I'm still feeling horrible and actually scrapbooked a new page for Suzanne's Fandango challenge at DSP-using the Baby HE page kit by Suzanne Walker, Digital Dates-Grungy by Meryl Bartho, Chipboard Bracket Element Set by Suzanne Walker (all available at DSP). Natalia just LOVES to play dress up and her Barbie dress is one of her favorites. One day a few weeks ago she had it on and begged me to take her picture, which I was happy to do. 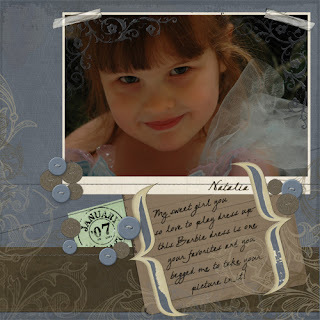 I snapped a bunch of pictures and was just thrilled with the way this photo turned out with her sweet face and chose it do use in this layout for the challenge. I just can't seem to get rid of this head/chest cold-it seems to go away and then a few days later it's back. It's just wearing me out-I have no energy, etc. I haven't been to the gym in days and just one 12 hour shift at work completely wiped me out. I supppose I shouldn't complain-the flu and an intestinal virus are going around so it could be worse but I just want to feel WELL again!!! I need to go to the grocery store today but other than that I'm planning on laying low at home-if I just keep Natalia entertained!! Well after not being able to weigh in on Friday due to the ice, I was able to make it to LAWL for my weigh in after being on the program for 1 week and 2 days and I am down another 2.4 lbs since last Monday. 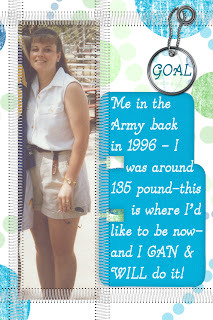 That makes a 5.2 lb total loss since starting and I'm so pumped!!! Natalia and I went to the gym after-finished week 3 of the beginner runner program: run 5 min, walk 2 min X4 and I actually felt really good. I'm just trying to take it day by day and keep on program!!!! I meant to post on Thursday while it was snowing again here in Texas-but time got away from me! 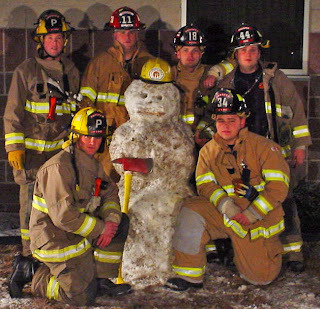 Todd was on shift but he and the guys didn't miss out on the fun and headed outside to make a snowman and the result is in the picture above! (Todd's in the back, 2nd from the left with the red hat) Natalia took a nap during the snow and missed all fun-hopefully next time. The next morning the roads were icey so we all stayed home-didn't even make it to the gym-I decided since it was gloomy out and we were stuck inside to clean out our master closet-WOW! That was a job-many hours later and 6 trash bags full of clothes and shoes-I have a VERY neat and organized closet and I'm very impressed with myself. Later that evening when I headed to church for 1st Friday Eucharisit Adoration I stopped at the attended donation drop at the local vet and dropped off those 6 bags-job well done!! Yesterday I worked and had a very nice 2 baby assignment-Todd & Natalia had a great day just spending time together while I was gone. Today I took on a different adventure-taking Natalia to Mass with me. The last time I took her with me was in July and she was just awful! So I haven't tried again since. But I didn't have anyone to watch her today and figuring she was 6 months older I could give it a shot. Our church has a new Mass at 9:15am which is a children's Mass. Natalia promised she'd be good and was excited to wear her pretty dress and shoes. I was nervous. When we got there I signed Natalia up for Children's Liturgy of Word-the children go into the other room with the teachers during the readings, gospel, and homily and come back after the prayers of the faithful. I was kind of worried Natalia wouldn't want to go but she ran right up front with the other kids to get their blessing from Father and then out to their class-thankfully she had a large bow in her hair so I could find her. She came back after with her lesson papers just as excited as she could be that she had been with her "friends". I just have to say "Praise the Lord" because she did SO well! She wasn't perfect but she really was so good! We'll definately try it again next week! Tonight's the Super Bowl-I can't wait to watch-just for the commercials! !